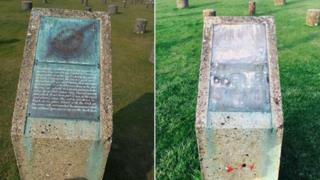 A pair of bronze plaques have been stolen from a prehistoric monument in Wiltshire. The plaques, dating from the 1920s, were taken from Woodhenge, which is two miles (3 km) from its more famous contemporary, Stonehenge. They describe and show a plan of the site, which was discovered by accident in 1925 by a passing RAF pilot. The plaques were originally installed by the Ministry of Works following archaeological excavations. Heather Sebire, from English Heritage, which cares for this site, said: "Woodhenge is an incredibly important heritage site and these plaques are a landmark in the history of how the site was discovered, excavated and presented nearly a century ago. "This is a serious case of heritage crime. We are working with Wiltshire Police and Historic England to identify the culprits and hope we can return the plaques to where they belong." Phil McMahon, inspector of ancient monuments for Historic England, said: "The sad theft of these historic plaques has deprived us of an important aspect of the story of Woodhenge. "They represent a key part of one of the earliest attempts to interpret and present to the public the complex and internationally-significant prehistoric monuments of the Stonehenge World Heritage Site. "We very much hope that the plaques can be recovered and restored to their rightful place at Woodhenge." Woodhenge dates back to about 2300 BC, and is thought to have been an important communal meeting place for people in the later Stone Age. Today, 168 concrete posts mark the positions of the original six concentric rings of gigantic timbers, which lay inside a circular ditch called a henge.